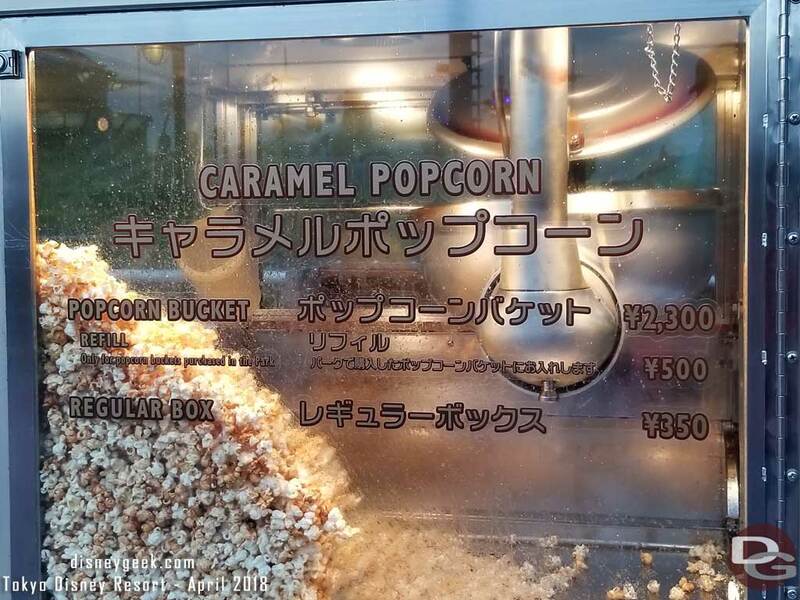 Popcorn and popcorn buckets are serious business at the Tokyo Disney Resort. 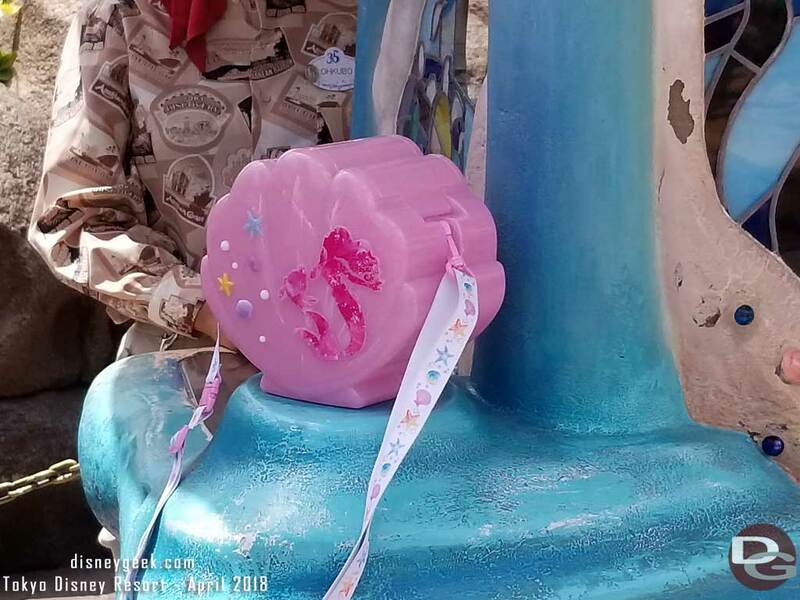 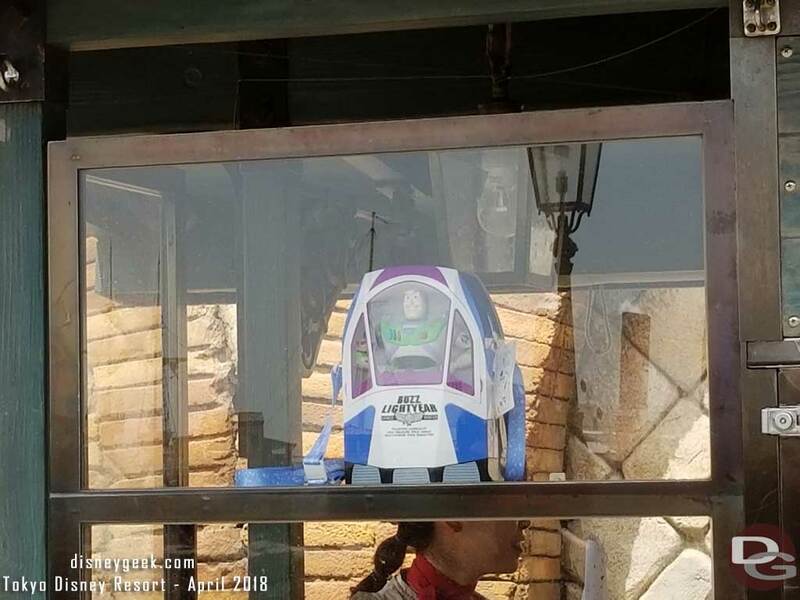 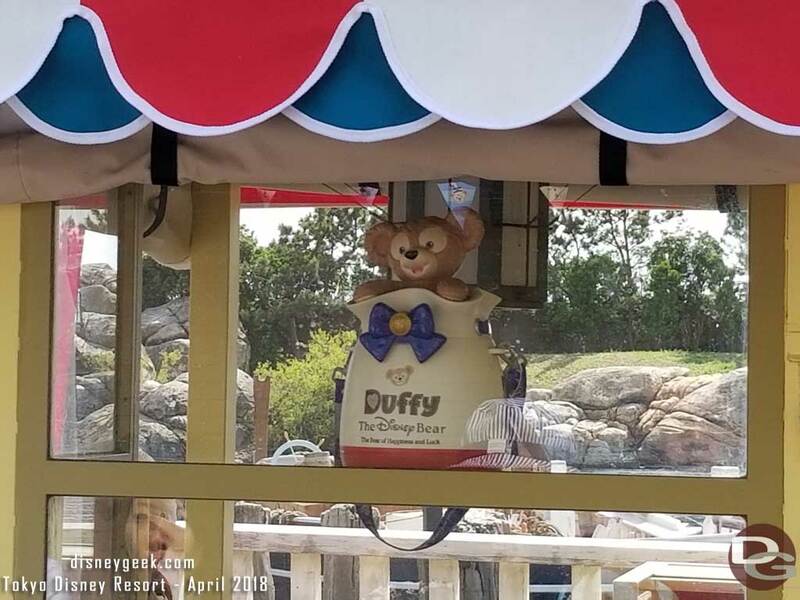 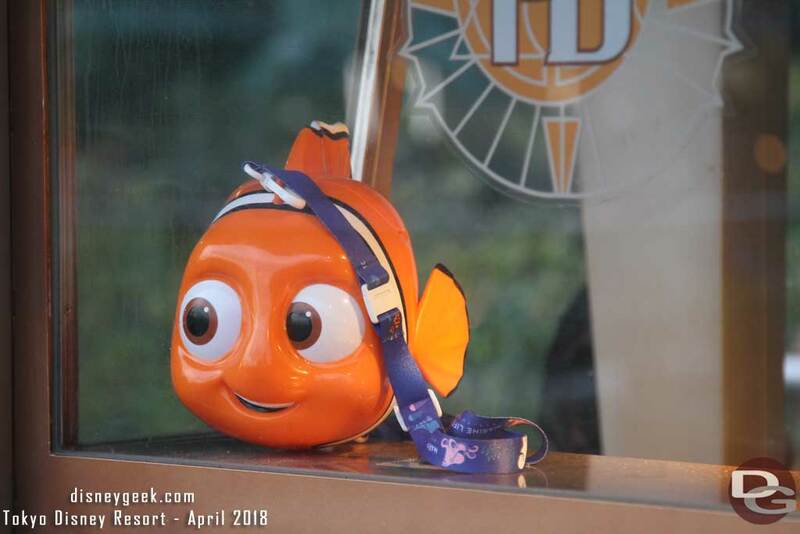 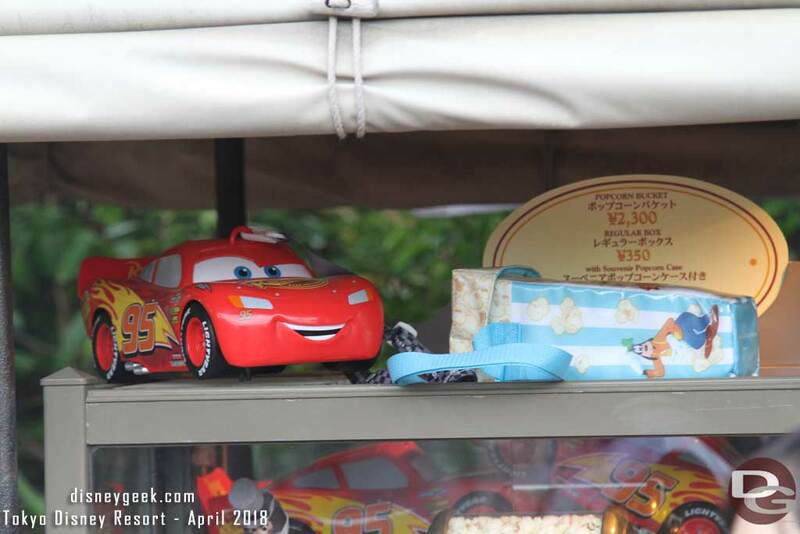 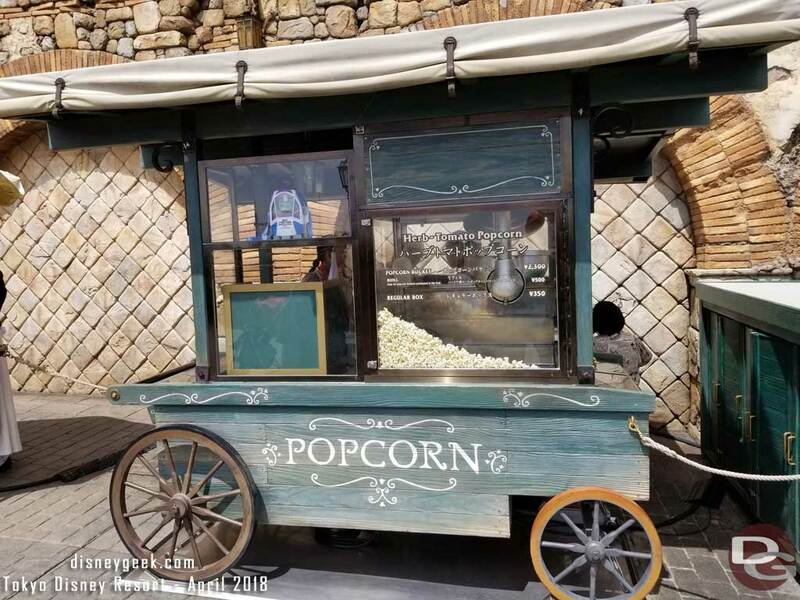 There are 25 carts featuring 11 flavors and over a dozen different commemorative popcorn buckets between Tokyo Disneyland and Tokyo DisneySea. 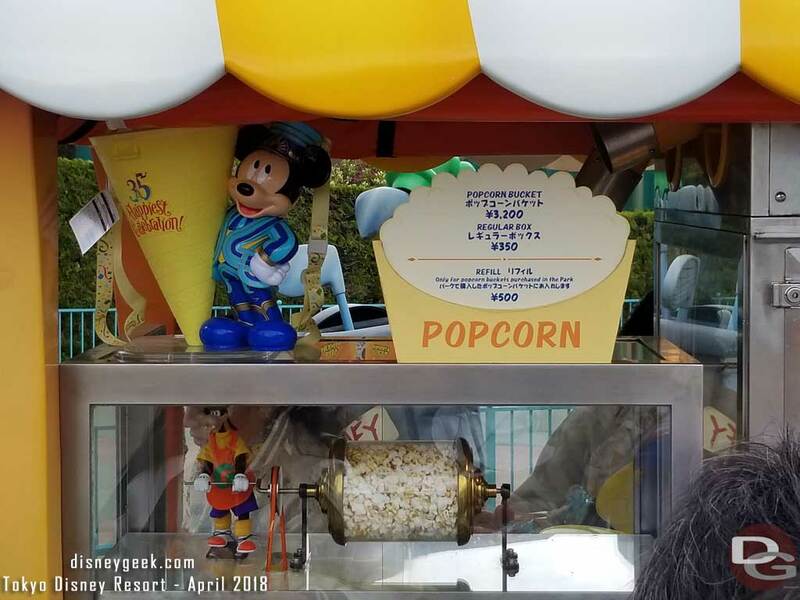 It is not uncommon to see lines stretching for several dozen guests at a popular stand and when a new bucket or flavor is introduced lines swell even more. 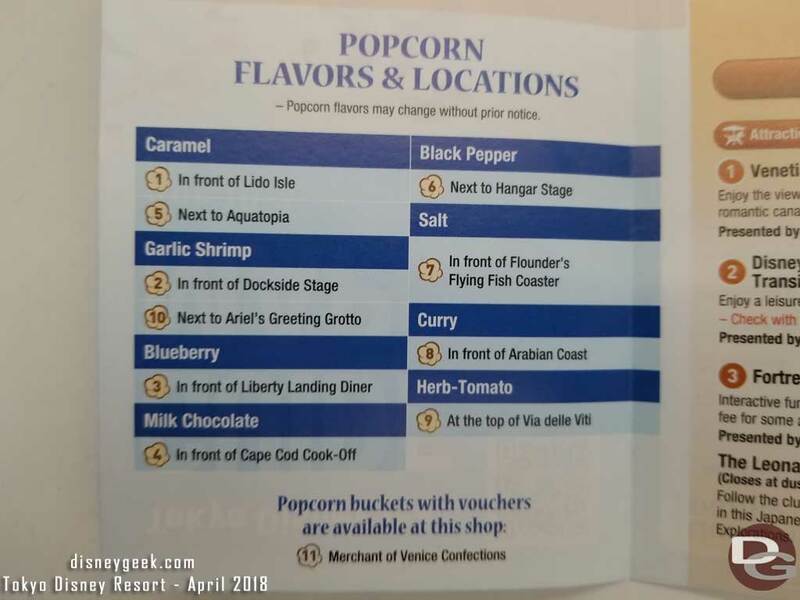 The park guide maps include the location and flavor of popcorn at each of the carts. 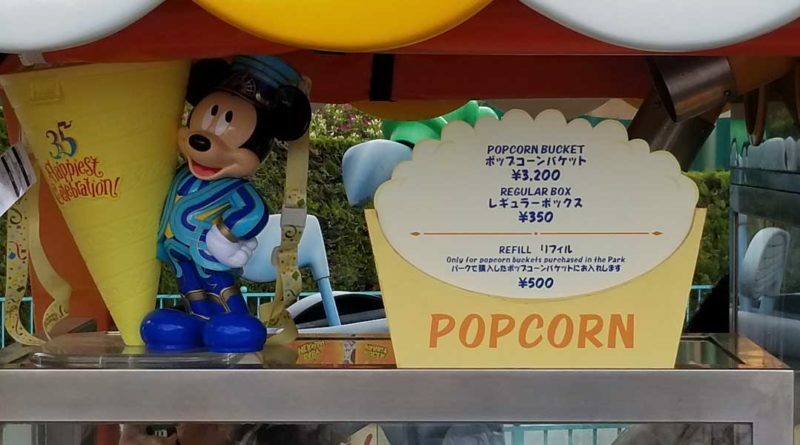 The collectible buckets range in price from from 1,640 yen to 3,200 yen and refills are 500 yen (for conversion $1 USD is about 110 yen). 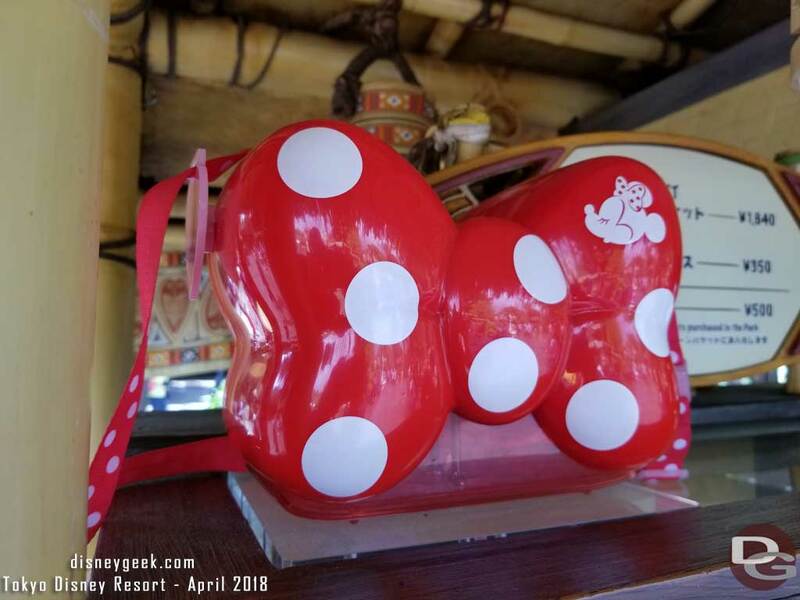 Here are some pictures from my April 2018 trip. 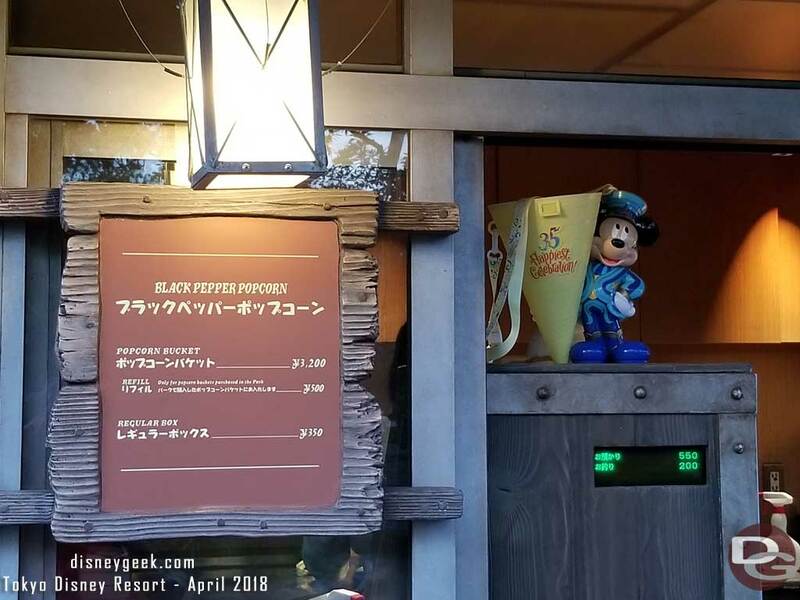 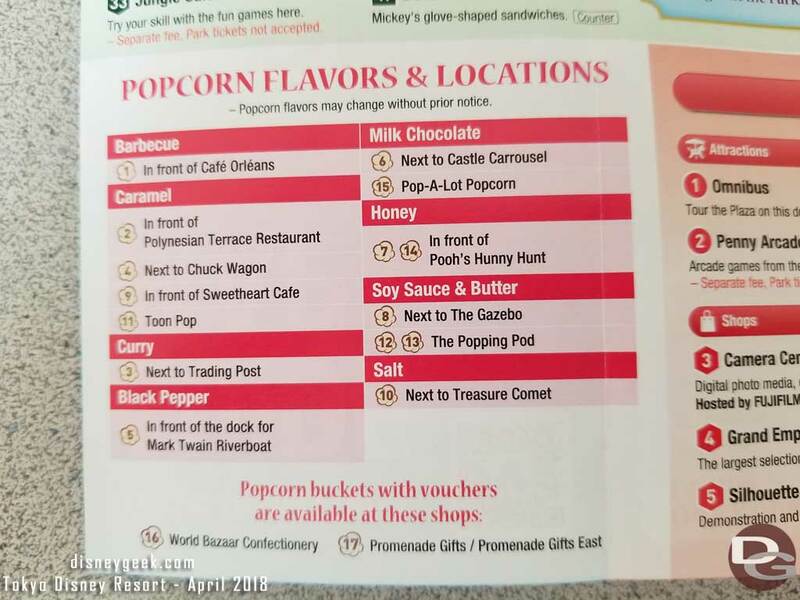 Tokyo Disneyland Popcorn Cart Location/Flavor listing on the park guide map. 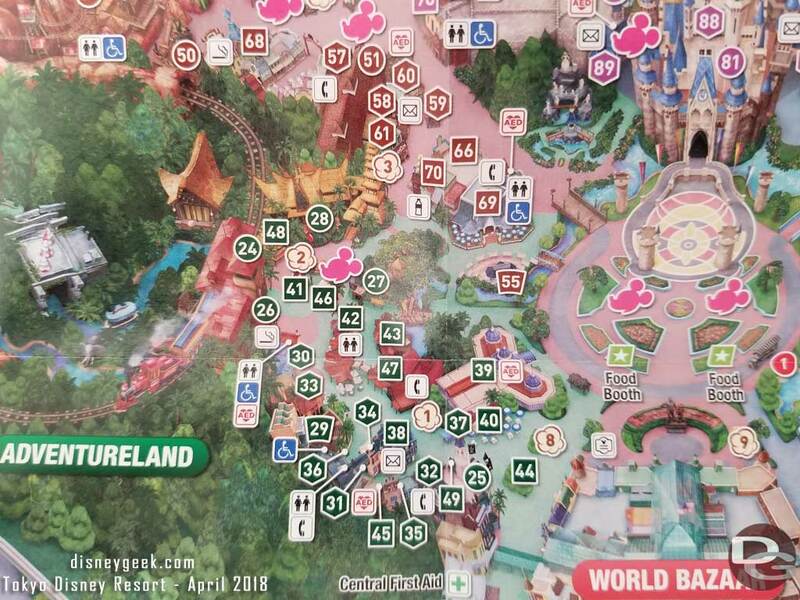 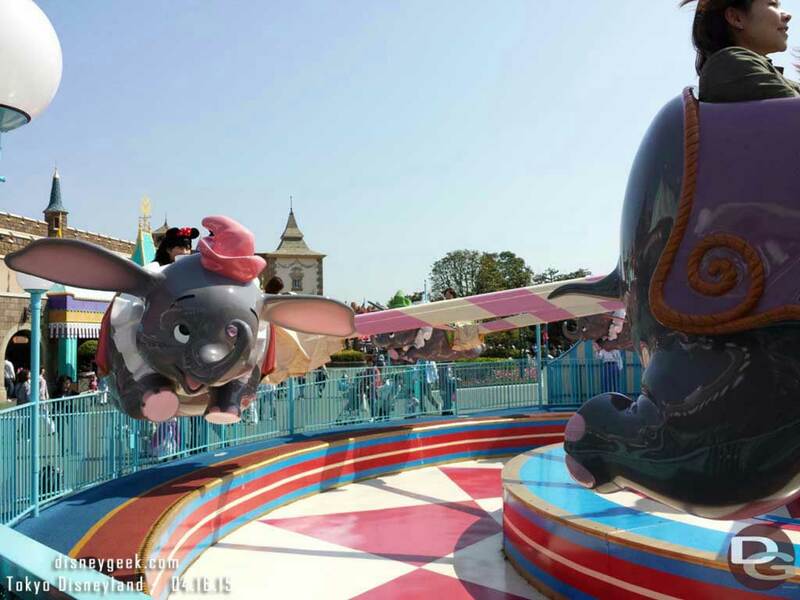 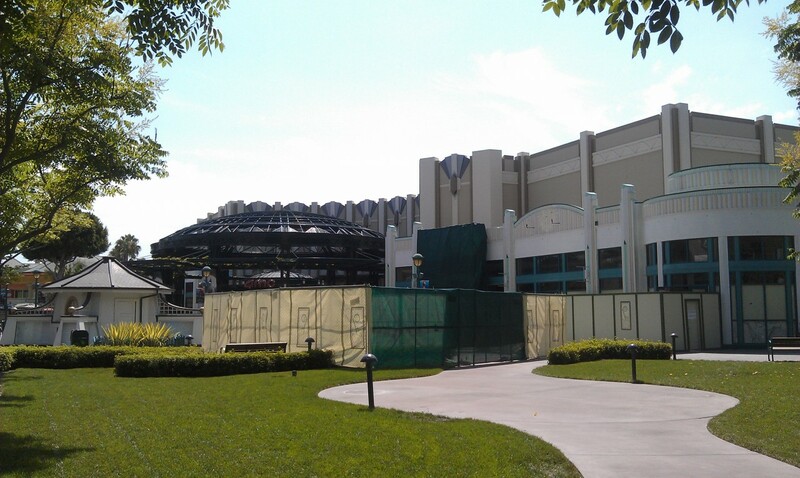 A look at the Tokyo Disneyland park map to see how the popcorn locations appear. 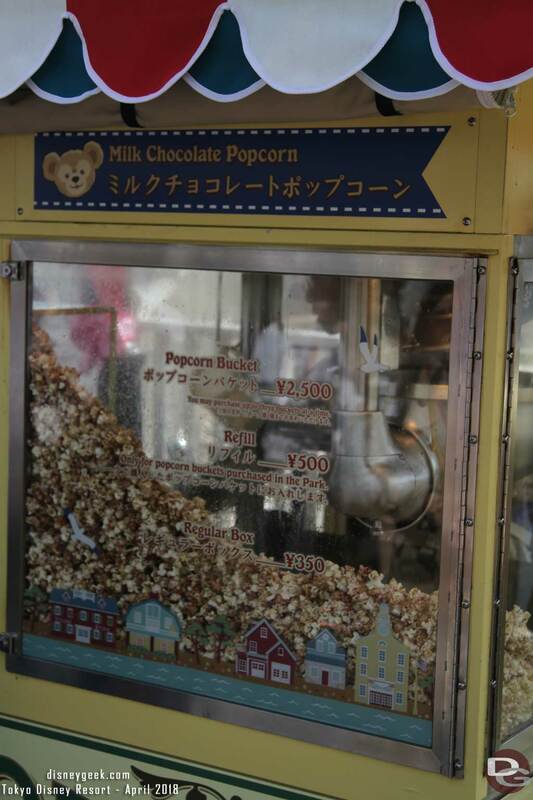 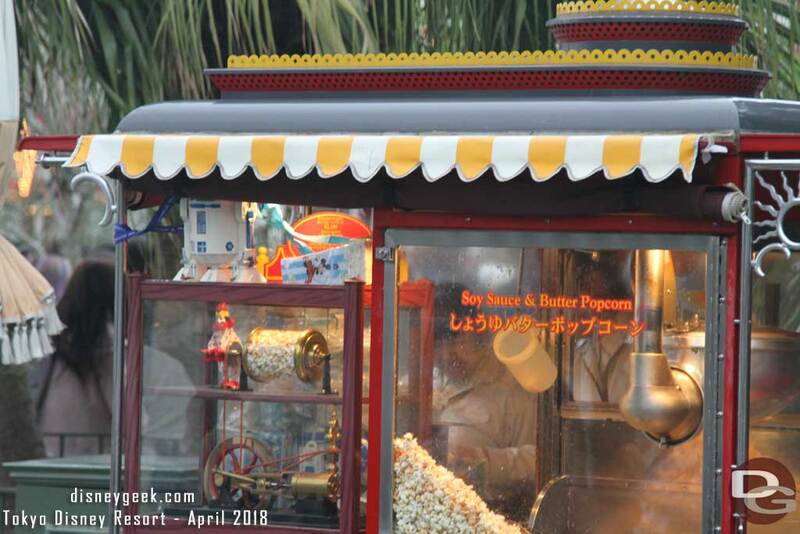 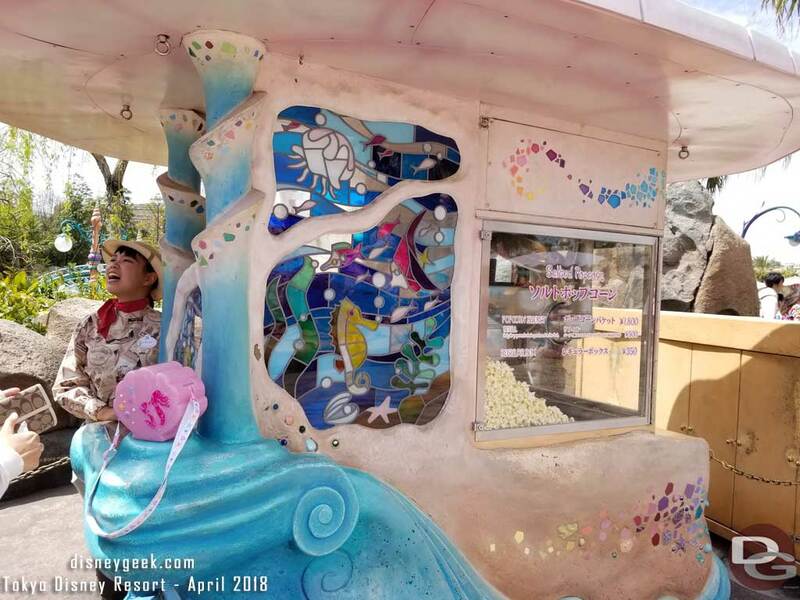 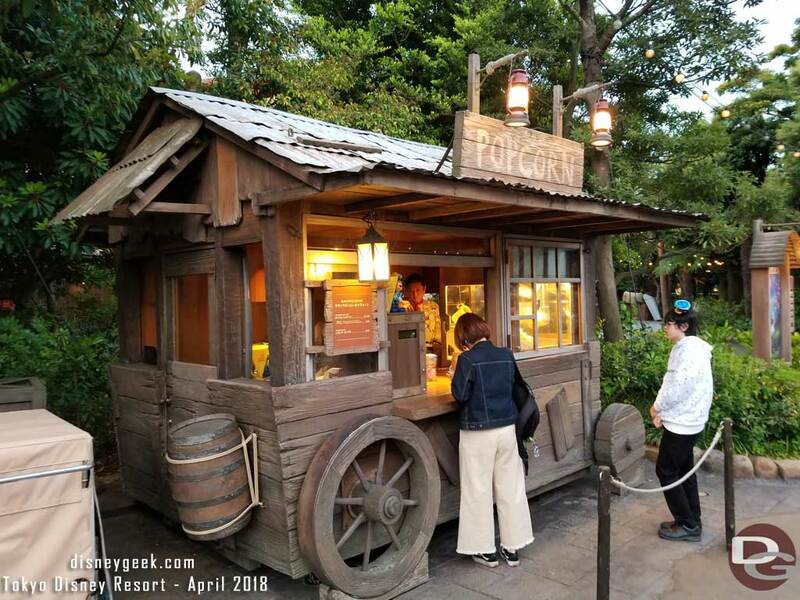 Tokyo DisneySea Popcorn Cart Location/Flavor listing on the park guide map. 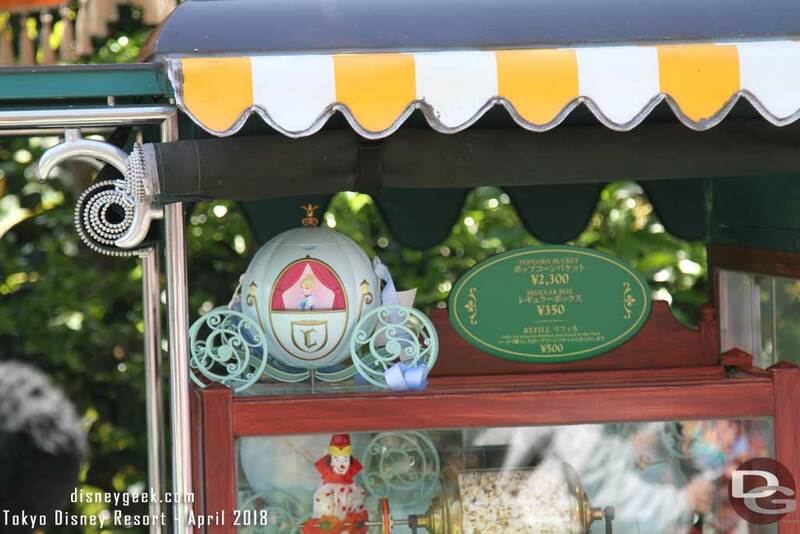 Tokyo Disneyland Popcorn – in front of Cafe Orleans features Cinderella’s Coach for 2,300 yen and Soy Sauce & Butter flavor. 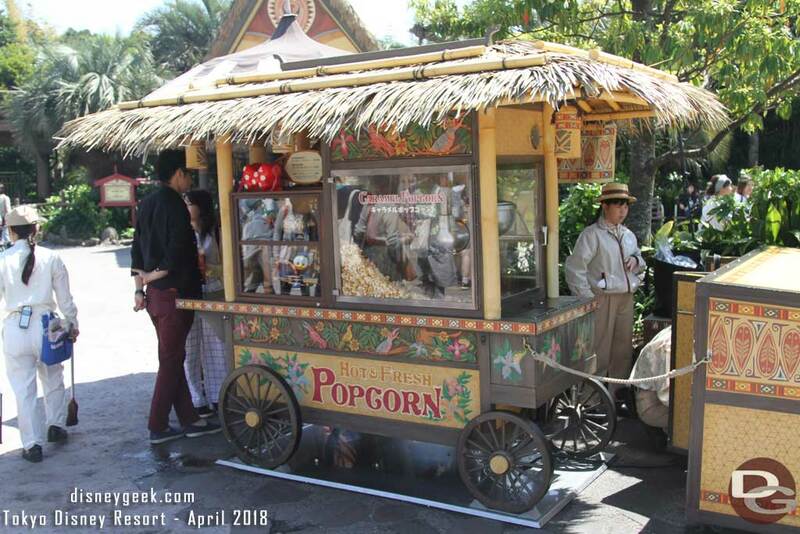 Tokyo Disneyland Popcorn cart in front of Polynesian Terrace Restaurant in Adventureland. 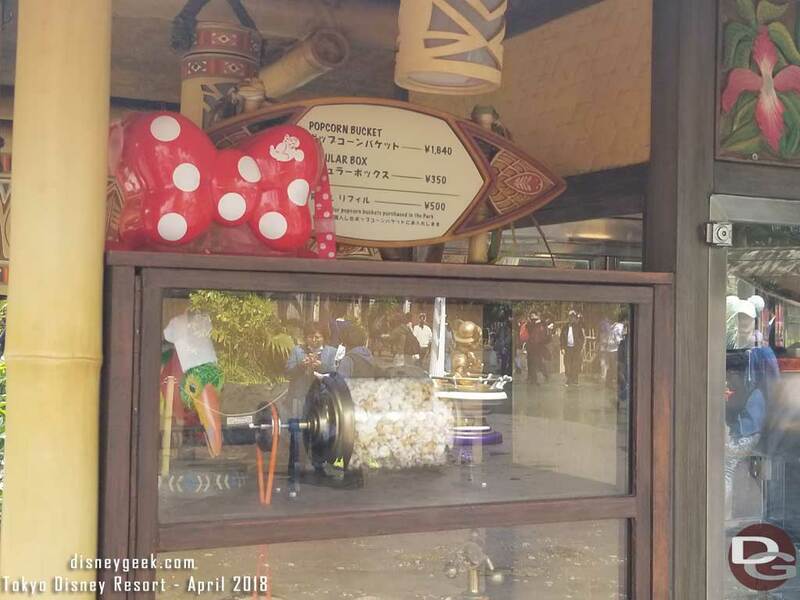 Minnie Popcorn Buckets for 1,640 yen at the cart in front of Polynesian Terrace Restaurant in Adventureland. 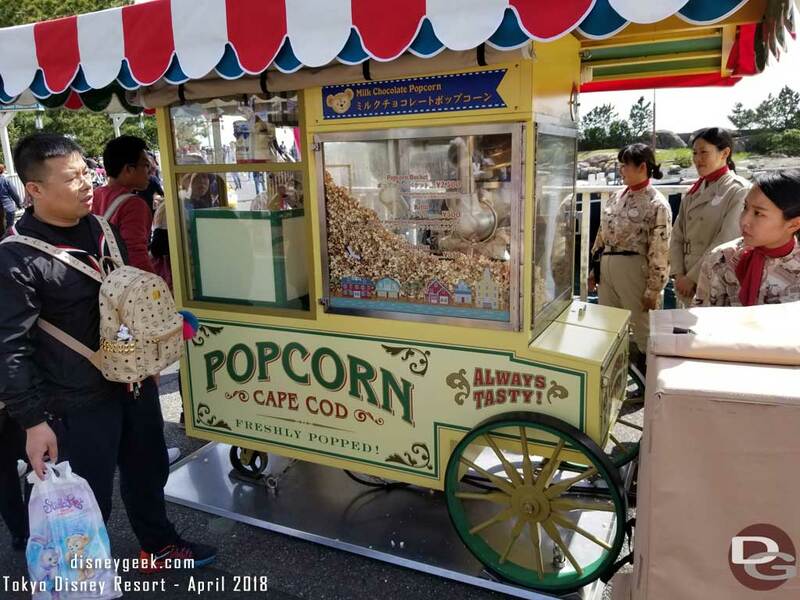 The cart in front of the Cape Cod Cook-Off features a Duffy Bucket and milk chocolate popcorn. 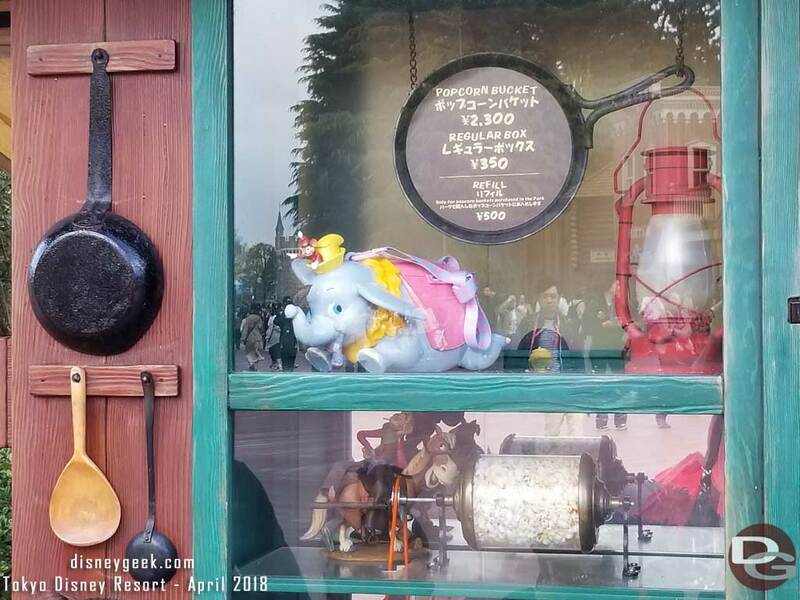 For more pictures from this trip visit my 2018 Tokyo Disney Resort Trip Summary page for links to all picture sets, post, thoughts & observations plus videos from the trip. 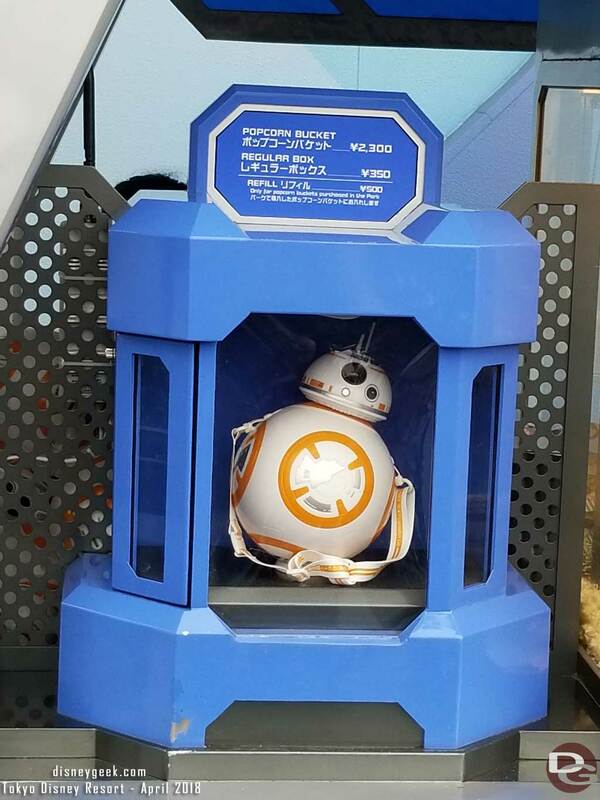 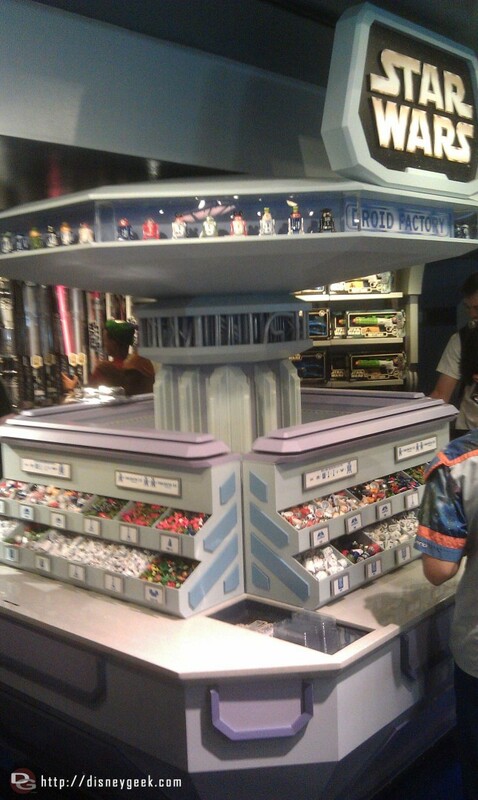 In Star Trader you can now build your own droid for $12.95 or two for $19.